Anyone who’s ever experienced debt will tell you that it’s like a dark cloud. It hangs over every single thing you do. It influences every decision, and controls your entire life. The cloud gathers, and grows larger on a day-to-day basis. Debt is a spiralling circle of despair, and it’s very difficult to get out of the trap. But, don’t worry, it is possible. By taking control of your finances, you can turn your debt problem around, and escape from the darkness. Trust us, it will be the best decision you’ll ever make! The first, and most important thing you can do when struggling with debt is face up to it. It’s so easy to hide from the problems, and ignore them. You throw the credit card statements in the bin, and ignore the phone calls. You can’t even remember the last time you logged into your internet banking! That has to stop. 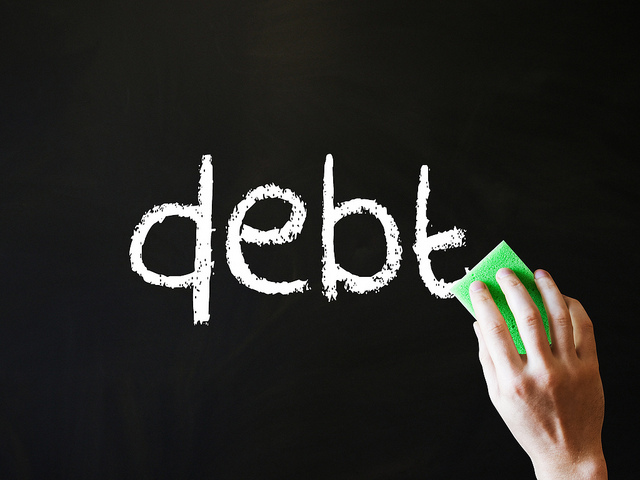 It’s time to make a list of your debts, and face up to that number. Debts add up across the board. From IRS tax debts to credit cards to mortgages to overdraft fees. Pull them all together, and understand exactly what you’re dealing with. Now it’s time to start thinking about the repayment schedule. Recognise that some debts are more pressing than others. For example, some IRS and tax debts can results in a seizing of assets and garnishing your wages. That must take priority, if that’s a possibility. Next, look to any short-term loans with high-interest rates. After that comes credit cards. Organise your biggest credit card debts, and prioritise them in order of interest rates and repayment figures. When you line them up like this, it’s easier to see where to start. Most lenders want to help you repay the money. It’s in their interests to get that money back, so they’ll help you renegotiate a better repayment schedule. We’re all scared about calling our credit card companies, but it’s better that you’re honest about your ability to pay. In many cases, they’ll help you work out a better arrangement. All you need is a little breathing room to start paying off those most important debts. Of course, we can offer you all the help and advice in the world. But, the best approach is to seek advice from the experts. That’s particularly true when it comes to complex tax debts. In this case, speak to a tax attorney, a CPA, or an enrolled agent. These professionals understand the IRS tax debt system, and can help you negotiate. Unfortunately, there is no shortcut when it comes to breaking the cycle of debt. It all comes down to sheer hard work, and a more frugal lifestyle. Start cutting costs from your day-to-day expenses, and set a realistic budget to curb your spending habits. It may take time, but you’ll soon be free of the crippling cycle of debt. When you emerge from the red, make sure you stay there!